Exchanges/Refunds available for 14 days. Returns must be in original condition with all packing material included to be eligible. The long cold winter days are giving way to spring showers. The underbrush is turning green, flowers are slowly showing their colors, With the changing season, it's time for a change of decoration. Looking for bunnies, chicks, eggs or baskets? What about flowers, birds, and butterflies? There's something for everyone in my store. Please browse my store for other listings. 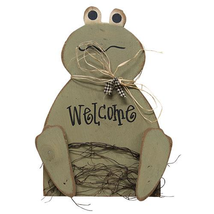 Welcome Frog Sign - 18" Our Welcome Frog is perfect for greeting guests into your home! It is painted sage green and has distressed edges. The word "Welcome" is painted across the front in a fun font! 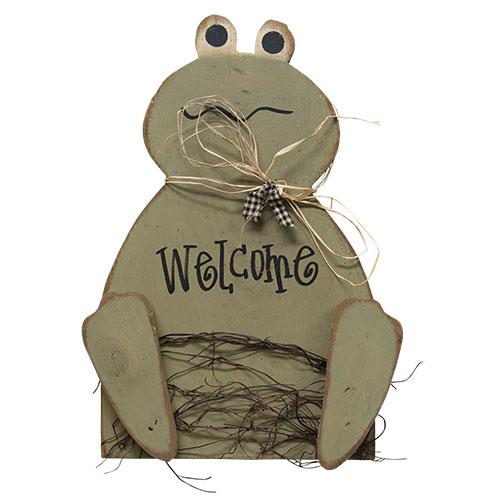 The frog is accented with vine and raffia and wears a gingham fabric bow. You can hang it from the thin wire loop on the back. The frog measures 18" high by 13" wide. RETURN POLICY If for any reason, there is a problem with your item. Please contact me prior to opening a return or leaving negative feedback. Doing so will just complicate the matter, delay getting the issue resolved and block buyers from repeat purchases. Please use the "ask seller a question" tab. Most problems can be resolved simply by sending out a replacement piece. This return policy is available for 30 days after the delivery date. So please contact me as soon as you realize there is a issue. Returns must included all original packaging material and paperwork for a refund. PAYMENTS Most payments are due immediately to insure all items are in stock. Auctions that do not require immediate payment are due within 3 days. A case will automatically open after the 3rd day. Failure to make payments will result in limited availability to make future purchases. I understand things do happen so please contact me if additional time is need so I can override the automatic settings. Best offers are preset to automatically accept or deny. All cancellations requests will be denied. There will be no acceptions to this rule. SHIPPING All shipments will be sent to the address provided to Paypal at time of purchase. Emails asking for shipment to be sent to a different address will be denied. All purchases will have tracking numbers provided. All items shipping thru UPS must have a physical address. UPS will NOT ship to a P.O. Box. All items have a handling time of 4-5 days.